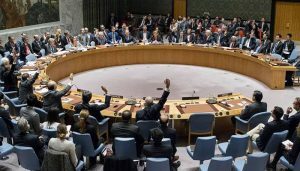 The United States has blocked a draft statement issued by the United Nations Security Council that demanded an investigation into the killing of 17 unarmed Palestinian protesters near the Gaza Strip’s eastern border. The draft statement was at first, was proposed by Kuwait with the demand that an ‘independent and transparent investigation’ under the privilege of international law into the bloody events on Friday’s Land Day protests. The statement alongside the investigation demand, also expressed ‘grave concern at the situation at the border’ and stressed ‘the right to peaceful protest’. Hanan Ashrawi who is also a member of the Palestine Liberation Organization (PLO) Executive Committee, criticized the US’ decision heavily by describing the US and the UK as being complicit in Israel’s persistent violations and violence. 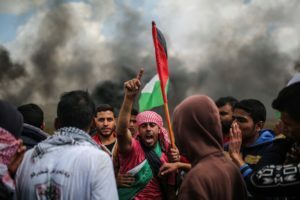 “The Israeli army used unbridled violence, unleashing more than 100 snipers and firing live ammunition, tear gas and rubber-coated steel bullets against the protesters before the very eyes of the entire international community,” Ashrawi said in a statement on Saturday. “Yet, the UN Security Council failed to agree on a statement condemning the egregious violations that occurred at the hands of Israel. “Such a counterproductive stance can render them [the UK and the US] complicit in Israel’s military occupation and in its persistent violations and violence,” she continued. Meanwhile, Israel’s minister of defence Avigdor Lieberman rejected all calls for an inquiry and investigation into the actions of the Israeli army. “Israeli soldiers did what was necessary. I think all our soldiers deserve a medal,” Lieberman told Army Radio on Sunday. Over 1,500 others were wounded on Friday’s protest when Israeli security forces fired live ammunition at protesters to push them back from Gaza’s border area, according to the Palestinian health ministry. On Saturday itself, the Israeli forces wounded 49 more people in the ongoing demonstrations. The mass protests with the slogan “the Great March of Return”, were organised by different civil society groups and was supported by all political factions to call for the right of return of all Palestinian refugees. It marked the start of a six-week sit-in, beginning on Land Day, an event that remembers six Palestinian citizens of Israel who were shot dead by Israeli forces due to their protest against government’s confiscation of large swaths of Palestinian land on March 30, 1976.